Stratford-upon-Avon -Shakespeare's birthplace and Anne Hathaway's cottage (outside). Today early morning, meet your tour manager and set off to Salisbury to view magnificent Salisbury Cathedral- The tallest spire in Britain and the world's best preserved original Magna Carta and Europe's oldest working clock. 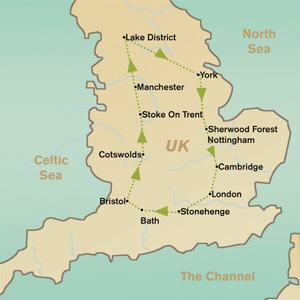 You'll continue your journey to visit the ancient site and stone circles ofStonehenge- The world heritage site as old as the pyramids designed as a place of sun worship or as part of a huge astronomical calendar. Then you are off to beautiful Georgian city of Bath where an orientation tour includes a visit to the Roman Baths, Abbey, the Royal Crescent, the Circus, and Assembley Rooms and see much more magnificent Georgian architecture. From here you continue to your hotel in maritime Bristol. Today morning you'll enjoy a scenic drive through the heart of the Cotswolds to Stow-on-the-Wold which is a delightful market town and along with Moreton in Marsh, perhaps the best known of the small Cotswolds towns. Were you'll visit the old market square which is surrounded by attractive buildings, pubs, shops and the oldest Inn's in England is found here. Later continue your journey to Stratford-upon-Avon set in the beautiful rural Warwickshire countryside where you'll visit William Shakespeare's birthplace and drive past Anne Hathaway's cottage. Finally, you are off to the Wedgwood pottery centre- England's finest china company which has been synonymous with beauty, craftsman and innovation for almost 250 years. Renowned for its ornamental wares black basalt and Jasper. From here you continue to your hotel in Manchester. After breakfast head towards Lake District and on to picturesque Windermere - UK largest National Park. A popular holiday destination, it is famous for its lakes and mountain. Here you will take a cruise on the Lake Windermere. Later drivealong the ancient Roman empires Hadrian walls, now the border between Scotland and England to the ancient City of York. York is one of the oldest cities and was the one of two capitals of Roman Britain and later northern capital of England. You embark on walking city tour of York includes the city walls, the ‘Shambles', the Stone gate and beautiful Minster. Later you'll check in to the hotel and rest of the day at leisure. Today morning you travel south through Sherwood Forest to see St Mary's Church where, according to legend, Maid Marion and Robin Hood were married. Then on to Cambridge the home of the famous University, magnificent architecture of Kings College Cathedral. Later in the evening you return back to London with wonderful memories of Best of England.